All four elementary schools will be offering “STEAM Wheel” rotations for students in grades 3-5 beginning for one semester this year. The purpose of this STEAM Wheel is to provide increased extension opportunities for all students as outlined in the school’s Site Plan. The STEAM Wheel will be centered on increasing opportunities for science, technology, engineering, critical thinking and the visual and performing arts. Each rotation will last for 5 weeks/60 minutes per week. Each grade level will have three rotations and include a variety of classes from community partners. 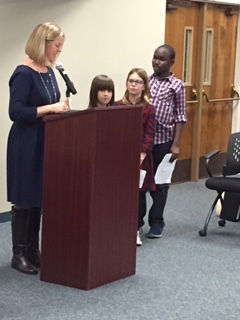 Christina Moore and some Robert Semple students gave the Board of Education a glimpse into the Wheel.